In the West we tend to regard ourselves as more sophisticated than people living in so-called less developed countries. This notion stems partly from the fact that westerners (especially city-dwellers) enjoy the luxury of dining at restaurants on a regular basis. Big cities are so “progressive” that people may eat breakfast, lunch and dinner in one day from three different places. In India the idea of eating at any restaurant weekly or even monthly is regarded as being both odd and unhealthy, and it is common to hear Indians brag that their parents “never ate a meal cooked outside the home!” Although some may say economic considerations play a role, there are far more interesting and powerful ideas about food which dictate why people in India do not eat out frequently. In the yogic experience, both what and how we eat are fundamentally important and it may be wise to consider some lessons about food from the birthplace of yoga. 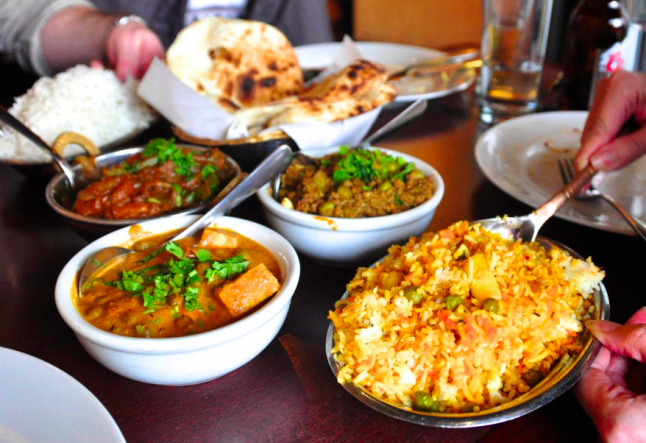 In India, the first tenet of eating well involves consuming food that is prepared from scratch and served immediately. The act of cooking begins early in most Indian kitchens, with spices being ground, vegetables chopped, and various pots and pans shifted around on the stove. The “mixie” (an Indian blender) grinds elaborate concoctions to be used for the day’s meals, while tea is brewed with a dash of hormone-free milk that is provided locally. Food is served three times daily and leftovers are given to pets or stray animals rather than preserved. People eat with their hands since the fingertips contain nerves that alert the brain which enzymes to secrete, and meals are enjoyed in the company of family members. One will almost never see anyone eating in front of the television, while waiting for a bus, while walking down the street, or while driving. Every attempt is made to prepare meals consciously since food’s vibration influences us on many levels. It is even said that if the servant is in a bad mood, she should not work in the kitchen that day, since her negative energies may detrimentally influence the meals and in turn those eating. Another important aspect of eating in India involves the notion that Nature knows best what foods are good for our systems. In the west, we have an unnatural variety of food items available throughout the year. Even if it is not mango season, we can usually still find a mango in the dead of winter that has been imported from some tropical country. However, according to ayurveda, it is not appropriate to eat summer fruits during winter, so we may actually be doing our bodies a disservice by eating that mango while it is snowing outside. In ignoring cues from Nature, we harm our bodies in ways that may only be noticeable in the long run. In India emphasis is also placed upon consuming sattvic food - that is, light, organic, vegetarian fare. Food that is processed, packaged, over-cooked, artificially flavored or colored, sprayed with pesticides, and non-vegetarian can never promote optimum health, for when we eat, we consume not only food but also prana (life-force energy). By choosing sattvic food we take in the highest prana, rather than the dense, “dead” properties of junkfood or meat. Sadly, most animals prepared for slaughter are kept in horrible situations, feeling fearful as they await their fate. Eating meat means ingesting this negative energy and contributing to a grave disregard for our fellow creatures, violating the principle of ahimsa (nonviolence). If a yoga practitioner consumes unhealthy, non-vegetarian food, the body cannot truly reach its purest state, which is why most yogis in India choose a vegetarian lifestyle. Although we may not be able to grow our own vegetables, we can certainly select life-giving food by shopping at farmer’s markets or healthfood stores. In India buying fruits and vegetables at outdoor markets is a daily event, and there is little packaged food available. Even the street vendors peddle such pure items as roasted peanuts, tender coconuts, or fresh sugar cane juice. Desserts (other than fruit) are not eaten regularly in India, probably because the combination of spices in Indian food satisfies the entire six aspects of our palate: sweet, salty, sour, bitter, pungent and astringent. A typical American diet satisfies only sweet and salty tastes, leaving one craving more (which usually ends up being an unhealthy dessert). Writing about food in India would be incomplete if we failed to mention the “tiffan wallas,” thousands of deliverymen (“wallas”) who bring lunches by bike to officeworkers. Amazingly, these lunches are not cooked in restaurants but rather in the homes of the officeworkers. The lunches are packed hot in metal containers (“tiffans”) and the wallas pick up the lunches at each home, stacking them on their bikes. At noontime, they deliver the lunches to the appropriate customers, recollect the containers in the afternoon, and return them to the homes where they will be washed and repacked with a fresh meal in the morning. Wallas remember which containers go to which customers despite the fact that the tiffans look nearly identical and perform their service like clockwork with very little margin of error, balancing the containers as they wind through busy city streets. Amidst modern amenities these wallas remain a traditional and beautiful reminder of how important it is to eat a good, home-cooked meal. Food is an inherent birthright of all life on earth. Growing up in the west we are told to clear our plates since people are starving in other parts of the world. However, if the idea of famine seems too remote, then let us consider images close to us. Today homeless people begging for food exist on many streets, and Los Angeles is even overrun with wild cats, looking for the most meager scraps to survive. Somehow, amidst our abundance of food, we have become desensitized to the plight of those who lack the most basic necessity. This year, instead of complaining about our bodies or eating holiday treats with guilt, let us eat more consciously, considering ourselves fortunate to have food at all. Our prayer for the New Year is that all beings everywhere be blessed with enough nourishment to live with dignity.